(Before that) On our 4th day in Nepal, we had our morning walk at Fewa lake walkway. I’m not a morning person on most days but whenever I’m in the lap of nature, I become one. Early morning stillness is always mesmerizing in such places and I didn’t want to miss it at any cost. Later in the afternoon, we headed for Sarangkot. It was in the day of the most important festival of Nepal- Dashain Festival. Wearing new clothes and putting tikas on their forehead are the common things we saw in this festival. Beside this, they celebrate Dashain festival with their families in the country side, fly kites, construct traditional bamboo swings which calls ‘ping’ in Nepal, prepare traditional dishes and perform ritual activities at temples. Lazy afternoon with snow-capped mountain view. During the festival, people leave the town and it becomes so difficult for hotels and restaurant to keep enough attendants to serve tourists. Taxi fare gets double too. This is what we didn’t realize when we initially planned our trip. However, we managed to hire a jeep and reached at Sarangkot on the festival day. Sarangkot village is known for its amazing panoramic view of Annapurna range, sunrise view point and paragliding adventure. We probably got the best view of everything from our hilltop lodge. We appreciated our friend’s choice for picking up probably the best lodge of Sarangkot. We actually appreciated any place that offered us showers, Wi-Fi and a fan. We had our lunch at a Nepali family house with Nepalese dish; chawl, dawl, chicken curry, vegetables, papar and pickles. We rested our weary self in the garden of Bhanjyang Village lodge to leave us plenty of time to shape up for next day adventure. 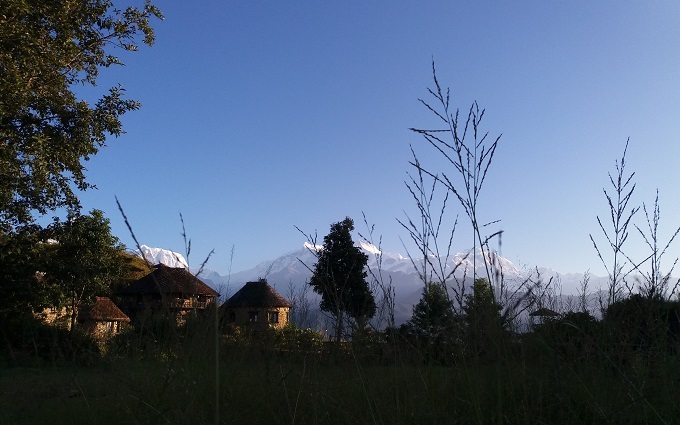 This lodge front yard gives you the best close up view of the Annapurna mountain range. Due to festival, their owner Gaurav wasn’t present but he told his staffs to take very good care of us. At night we hung out at lodge’s small café/cocktail bar. We had our dinner there and the food was excellent. They brought me a guitar to enjoy the evening jamming and to sing along with my friends. Good music and cool vibes were all you need for a good night sleep. Next day it was our first adventure sports in Nepal. We booked our paragliding schedule with Flying Buddha Paragliding agency; one of the best paragliding agency in Pokhara, Nepal. We were so thrilled and nervous at the same time. We went to bed early but naturally, no one really slept, and in a dreamlike state we woke up very early in the morning. The best part was in our lodge, they have this private view point to see the sunrise and sunset. Waking up to the beautiful view of snow-capped mountains behind our lodge in Sarangkot was mesmerizing. Mystical morning view at Bhanjyang Village lodge. At noon, a private vehicle from paragliding agency had arrived at our lodge. There we met our four licensed pilot. We were six friends but only four of us booked for it. They took us high above the hills from where we stayed. In Paragliding, the pilot “takes off” from an elevated position, usually from the top of hills or mountains, and then uses wind forces to help him maintain flight. 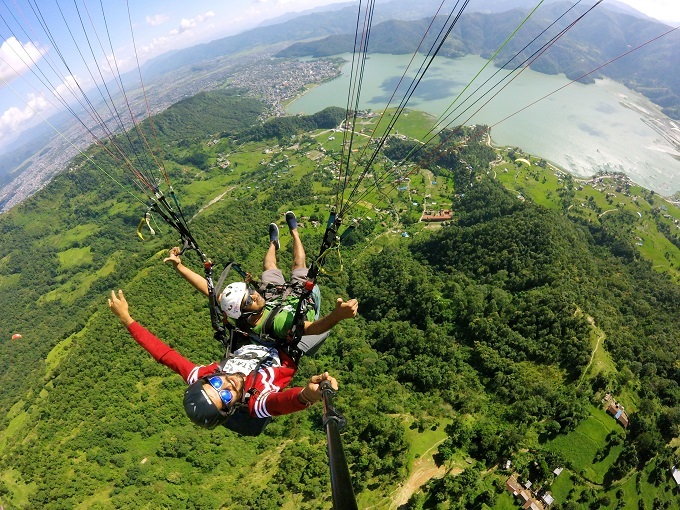 Pokhara is one of the top 5 commercial tandem paragliding locations in the world. Relying solely on wind forces and thermal, flight duration is not more than 30 minutes and fly 1300 meters above sea level. I was the last person from our group to take off and probably got the coolest pilot to paraglide. Since paragliding is an extreme sport, it’s possible to trip, fall, and get seriously injured in the process. It’s better to listen to pilot’s instruction carefully. I was all geared up and ready to fly. My pilot Mr. Ashish was assessing the wind condition to see if it was good for flying. After setting up the canopy in the air, I had to run slowly towards the cliff. Then we took off and flew in the sky like bird. It was absolute joy looking down from my seat, seeing myself flying in the air. Throughout the flight I guess I talked little too much with my pilot from over excitement. During the flight, I saw my other friends were flying in the sky and enjoying as much as I did. To get some extra excitement you may request your pilot to do acrobat over Fewa Lake. When my pilot asked me if I wanted acrobat, I said yes straightaway. This was extreme! Paragliding experience was by far the coolest thrilling adventure I have done in my life. I personally think that extreme sports like paragliding is something that all of you should try at least once in your lifetime. We had landed safely after 30 mins of flight. 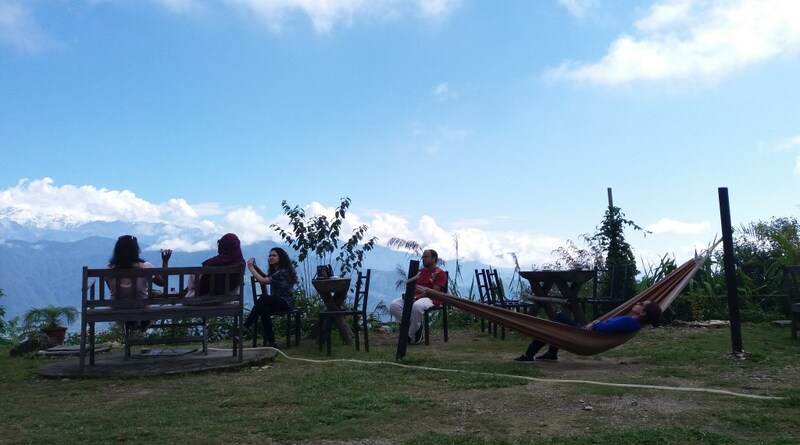 Paragliding venue in Sarangkot is the safest because of its convenient take- off spot, flying area which is over the Fewa Lake and perfect landing zone. And Of course, take all safety precautions and only fly with the agency that got licensed tandem pilots.